To get notified when this item is available again simply give us a call or send us an email with your name, stating the title, artist and product type e.g. Original, Print etc. If you would like to view this artwork at the artist’s studio in East Sussex simply give us a call on 01372 897070 or email info@opiusgallery.com. To view artists from other areas click 'View Art Locally' in the main menu above. Description: An original painting by by artist Kalpana Soanes. 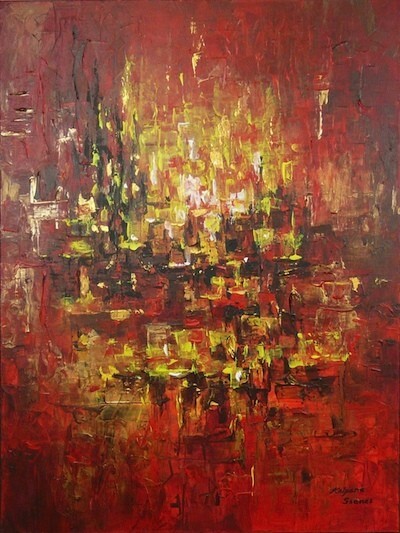 Shades Of Warmth, a large abstract on chunky canvas. Sure to brighten up any room, any season. Rich in colour and texture. Painted sides, ready to hang, no need for a frame.